Stocks are higher this morning on no real news. Bonds and MBS are down small. The ISM New York Survey increased from 63.1 to 68.8 last month. Factory orders rose 1.8% in June. May was revised downward to -1.1%. The IBD / TIPP Economic Optimism Index fell to 46.9 from 48.1. Puerto Rico officially defaulted on its debt yesterday. The Obama Administration has said that there will be no Federal bailout of the U.S. commonwealth. Want to know where the bodies are buried? Here is a list of the muni funds that hold PR debt. Recovery rates could be as low as 35 cents on the dollar, according to Moody’s. July auto sales were brisk, as SUVs and luxury vehicles sold well. Pretty much everyone reported an increase of sales from 2.4% to 10.5%. The second quarter was rough for the mortgage REITs. American Capital Agency reported a 6% drop in book value last week (a staggering number), and MFA Financial missed as well. Mortgage REITs are big investors in mortgage backed securities, which are sold by your friendly secondary folks. They have been de-leveraging ahead of the Fed’s normalization process, which means that they have less appetite for new paper. This means that mortgage rates will be slightly higher, at the margin. Interestingly, the mortgage REIT sector seems to have found an angle for cheap financing by joining their local Federal Home Loan Bank. 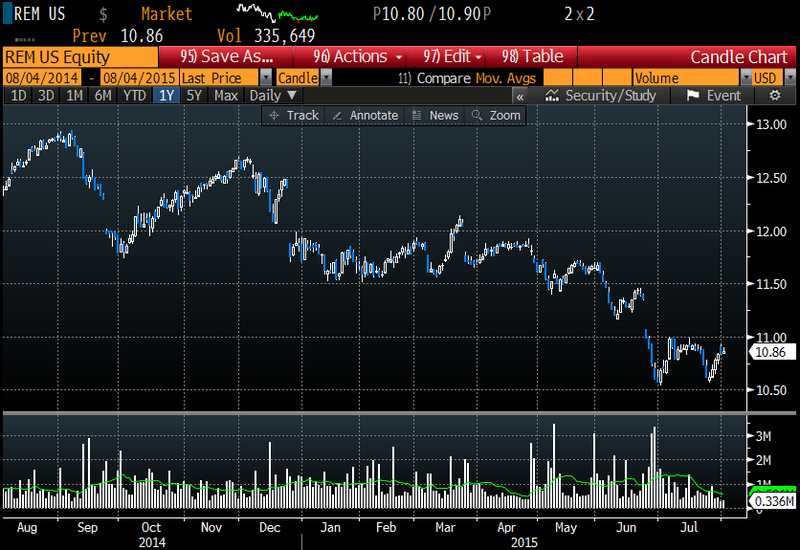 You can see how the sector has gotten smacked around by looking at the chart of the iShares Mortgage Real Estate ETF. Home prices continue to rise on tight inventory, according to CoreLogic. Home prices rose 6.5% in June and are now 7.4% below their April 2006 peak. Tight inventory remains an issue – nationwide, the average supply of homes for sale was 4.8 months. 6.5 months is considered a balanced market. In highly desirable areas, like San Jose and Denver, the supply was 1.6 months. Colorado led the country with almost 10% home price appreciation, while the People’s Republic of Taxachussetts brought up the rear by falling 5%. The Northeast still has a clogged foreclosure pipeline to deal with. “revolting against its ruling class” is as good a phrase as any to capture the political moment. Instead, housing prices are going up for the same reason that college tuitions are: because the government facilitates lending people money at concessionary rates to purchase them. The Fed has, despite the occasional sobering gander in the direction of reality, been keeping the cheap-money sluices pretty much wide open. The federal regulators have loosened their grip over Fannie Mae and Freddie Mac’s lending activities, and, according to a Fed report released Monday, banks are once again loosening up their lending standards. This ended badly the last time. It’ll end badly this time, too. I disagree there is another housing bubble. IMO, a lot of the investment in Coastal CA and NYC is coming from offshore (particularly China). Foreigners are making a dollar bet (and diversifying their portfolios) and Chinese investors are doing it to get green cards for their kids. (If you invest 500k in a project that creates at least 12 jobs, you get green cards). I suspect the people investing in these projects are not highly levered, but with foreign investors, you never know. I suspect any money they owe, they owe to their local banks, which means it won’t be a financial crisis here if it all blows up. Aside from Coastal CA, and the other hot markets, you just aren’t seeing that kind of price appreciation. Sure, they have rebounded off the bottom, but we are almost 9 years past the peak, so if we are withing striking distance of the previous peak, that sounds about right. Second, what made the prior bubble so bad was people using cash-out refis and using it to fund further speculation or consumption, not home improvements. You just don’t see that much going on today. The underwriting standards for Fannie Mae / Ginnie Mae loans were tightened considerably after the crisis, and most professionals think they went too far. You know how the street is: after a major sell-off, investors get too conservative. The changes are relaxing the new rules somewhat, but overall, credit availability is still very tight. On a scale of 1-10, pre-bubble we were a 10, afterward we dropped to a 1, and we have maybe changed to 1.25. Yes, the cheap money sluices have created a bubble, but it isn’t in real estate – it is in sovereign debt. Would you tie up your money for 10 years lending to the Italian government for 1.77%? Or tie up your money lending to the US government for 30 years at 2.88%? The only way those bets make sense is if inflation is done, dead, dusted, and buried for the rest of your life. Of course how big of a crisis is it when a certain bank holds just under 4.5 trillion of the stuff based on an equity tranche of about $58 billion. For those keeping score, that is a debt to equity ratio of 76x. Also how much of the housing market bounce back would you say is due to hedge funds and other investors buying up distressed real estate and turning it into rentals? That’s probably been done with leverage, correct? I think we throw around the term “bubble” too loosely. Bubbles are primarily psychological phenomenons where people think an asset class is special and that you can’t lose money in it. We saw that in the late 90s with stocks and in the 00s with residential real estate. The only asset where people are convinced you cannot lose money is Treasuries. As far as the hedge funds, during the dark years of 2009 – 2011, there just wasn’t a lot of leverage to be had, so I don’t think we have a worry there. There is tremendous demand for real estate right now, and they would be able to unload their portfolios with relative ease. I don’t think the trade for people like Blackrock was to buy / lever / and earn a cash flow. Their trade was to buy / rent / and securitize. I assume you still consider China’s stock market situation to be a classic bubble. classic example of one…although i would cite real estate more than stocks.. When I bought my house in December, it was hard, and the application/credit review process was punishing. Compared to my two previous house purchases it was far more difficult. Ultimately, they wanted to give me the loan and I eventually got it, but it was hard. Also, the sale of the loan from the smaller bank to Wells Fargo was much faster. First time, the bank I’d gotten the loan from carried the loan for a year before selling it. Second time it was six months or eight months or something. This time, it was about two days. I never even made a monthly payment to the bank I’d gotten the loan with. World To End Tommorrow, Women and Minorities Hardest Hit! Rubio makes clear, at Southern Baptists Convention, that he would consider deploying American ground troops to fight ISIS.